As we all know, foundation is one of my weaknesses favorite products to buy and use - as evidenced by this Instagram picture. So naturally as the weather begins to change, so do my makeup choices. Though I have quite clear skin (thanks to my 7.5 hour cleansing ritual I do each night), I still appreciate foundations that give coverage, as I like to have a more "finished" face rather than just a moisturizer with a tint. So with each of these choices, my skin gets coverage but with a more lightweight and breathable finish. 1. Chanel Vitalumiere Aqua was actually a purchase I made during the winter season but has become a great choice for me in the warmer months. The finish is more dewy which I tend to dial down a bit with a dusting of my Laura Mercier Translucent powder, but the coverage and feel is subtle and comfortable. 2. Giorgio Armani Maestro fusion makeup is probably one of the innovative and interesting textures I have ever come across - with the formula being extremely thin and liquid (almost with an oily texture) but drying down immediately to a matte finish on the skin. Many have described this foundation as "your skin only better" and I couldn't agree more. I apply with my fingers as the heat of my hand helps the foundation meld right into the skin - and leaves me with a flawless finish. 3. Make Up For Ever Mat Velvet is often the foundation I reserve for spring/summer nights because it gives buildable coverage, while still maintaining a matte finish. 4. Chantecaille Just Skin is labeled as a tinted moisturizer but I find that the coverage is more substantial than other similar products, which is why it quickly became one of my favorites. Though I may love a natural face, it takes more products than not to create that "natural" look. And as you can see by the pathetic and almost nonexistent dent I made in the tube, a little goes a long way. 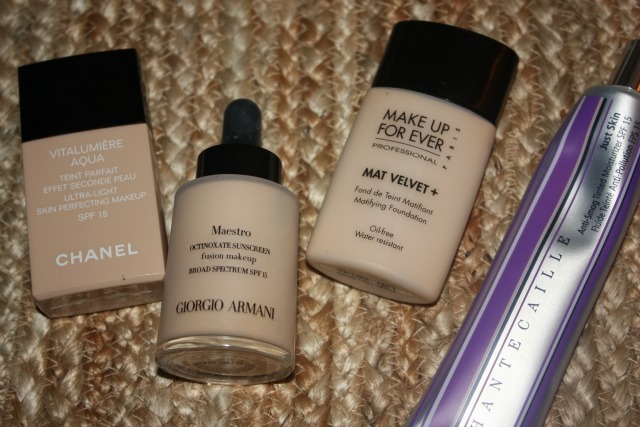 Have you tried any of the above foundations - what are your thoughts? You totally do! I have grown to really love!